This Newsletter contains the most worthy developments and events of the OpenNebula project and the community during this last month of July, and the plans for the upcoming months. We want to remind our users that OpenNebula Systems, the company behind the OpenNebula Project and vOneCloud, has established a new subsidiary to oversee all business operations and to support the OpenNebula community in the U.S. If you are interested in supporting the OpenNebula community in the US, let us know. 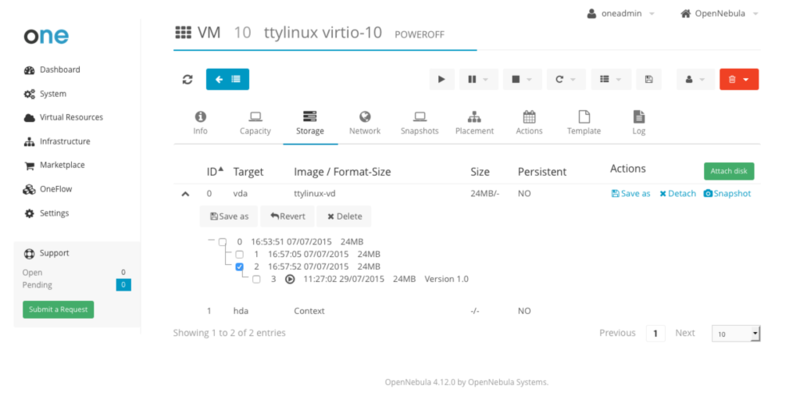 The team has released the first Beta of OpenNebula 4.14 ‘Great A’Tuin’. We hope you enjoy using it as much as we did developing it. The new features and usability improvements present in this new release couldn’t have been without our community support and feedback. We want to thank you all for your contributions to make OpenNebula as mature and reliable as it is today. Every little helps! One of the most interesting new features for cloud users and administrators is the ability to create and maintain a tree of VM disks snapshots, for Ceph an Qcow2 backends. Also important, the ability to save VMs into VM Templates for later use greatly improves the usability of OpenNebula based clouds, to which also adds the much better state management of VMs for recovery from failures. There are many other improvements in 4.14, like a more flexible context definition of network attributes; the ability to import running VMs not launched by OpenNebula from all the supported hypervisors (including the hybrid ones, for instance now it is possible to manage through OpenNebula Azure, SoftLayer and EC2 VMs launched through their respective management portals);the possibility to cold attach disks and network interfaces to powered off machines (which complements the hot attach functionality); improvements in accounting to keep track of disk usage; better logging in several areas; the ability to pass scripts to VMs for guest OS customization; and many others. A great effort was put in this release to help build and maintain robust private, hybrid and public clouds with OpenNebula. There are some features the team is still polishing and decided not to include in the Beta1- For instance another major feature is the ability to resize an existing disk for all the supported OpenNebula backends. If your VM needs more disk space than the one provided by the images used for its disk, you can now set a new size prior to instantiate the VM, OpenNebula will grow the disk and the guest OS will adapt the filesystem to the now bigger disk at boot time. The disk space won’t be an issue anymore. To support this feature, a new set of context packages has already been released so you can start preparing your images for disk resizing. Another huge feature to support HPC oriented infrastructures is the consumption of raw GPU devices existing on a physical host from a Virtual Machine. A new type of consumable has been defined in OpenNebula and taken into account by the scheduler. VMs can now request a GPU, and if OpenNebula finds one free resource of type GPU available, it will set up the VM with PCI passthrough access to the GPU resource. Channels to help people try out OpenNebula is a hassle-free way are key to foster adoption of OpenNebula. The OpenNebula project is well aware of this, so it has teamed up with Microsoft to offer a new OpenNebula Sandbox in the Azure Marketplace. Currently you can try out 4.12.1, but we will update as usual all the SandBoxes to Great A’Tuin as soon as the stable version is out. Summer is upon us, and this does not prevent the OpenNebula community to keep contributing to the rich ecosystem. Since the Beta1 is out, we want to make a call for feedback. Please install in a test environment Great A’Tuin, and let us know through the community forum. It is your feedback what makes OpenNebula user friendly, so thanks in advance!. For the team working in the cloud trenches, comments like this one are like a blow of fresh air that keep us going, stronger, towards cloud excellence. Thanks! Contributions to the OpenNebula ecosystem are always great news, to enable integrations with new components, develop new functionality and ease the day to day cloud operation. But if they are maintained such as this nodejs binding for the OpenNebula API, then we are talking about quality ecosystem. Excellent contribution. Extensions to the OpenNebula contextualization system are also always good news, like this new contextualization package for Gentoo written as an Ansible playbook. Another great contribution enables OpenNebula to manage LXC containers. LXC is a userspace interface for the Linux kernel containment features. It lets Linux users easily create and manage system or application containers. With this amazing contribution OpenNebula can deploy LXCs with the intrinsic improvements in performance. The new addon includes motorization and virtualization drivers, kudos to Sergio Vega and José Manuel de la Fé for their contribution. The upcoming third edition of the OpenNebulaConf will be held in Barcelona this October 2015. The Conference is a great opportunity to meetup and share your OpenNebula experiences with the community. Your company may be interested in the sponsorship opportunities for OpenNebulaConf 2015. If you are interested, you can apply with this form. StorPool just joined as Platinum Sponsor. We would like to take this opportunity to also thank our Platinum Sponsor PTisp; Gold Sponsors ungleich, Xen Server and NodeWeaver; and Silver Sponsors Runtastic and No Limit Network. You can read more details about the presentations here. If you want to host a TechDay in your area, let us know. An excellent event was also carried out in France, the SophiaConf2015. Check out the OpenNebula presentation given by members of TAS Group France on why they chose OpenNebula for their infrastructure, very interesting (warning: you need to understand french!). OpenNebula Conf 2015 is getting closer and we would like to keep sharing with you the companies/projects that are sponsoring this year’s conference. Now it is time for StorPool Storage, as part of our Platinum Sponsors. You can meet them in the booths area during the coffee and lunch breaks. At the event StorPool will demonstrate the joint solution, answer any questions and will help customers to improve the design of their cloud. If you want to participate in OpenNebula Conf and meet StorPool and other OpenNebula users, remember that you are still in time for getting a good price deal for tickets. Also, if your company is interested in sponsoring OpenNebulaConf 2015 there are still slots available. OpenNebula 4.14 ‘Great A’Tuin’ Beta 1 released! 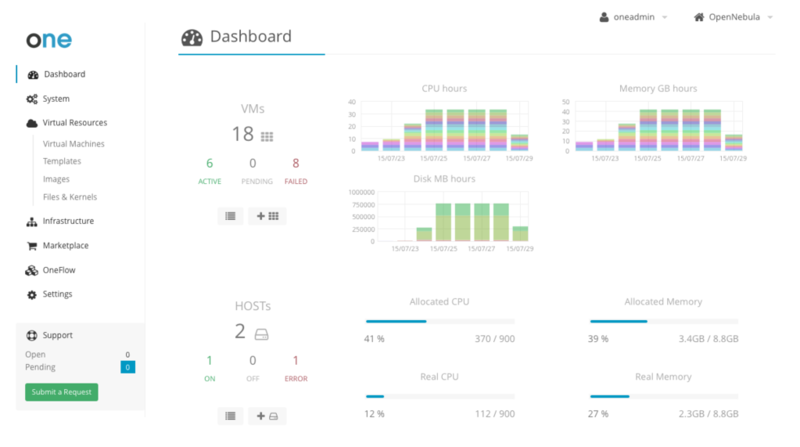 The OpenNebula project is proud to announce the availability of OpenNebula 4.14 ‘Great A’Tuin’ Beta1. This release ships with several improvements in different subsystems and components. The Sunstone interface has been completely refactored, for maintenance and performance reasons. Expect major improvements in Sunstone from now on. Also, we are sure you will like the subtle changes in the look and feel. Several major features have been introduced in Great A’Tuin. One of the most interesting for cloud users and administrators is the ability to create and maintain a tree of VM disks snapshots. Now VM disks can be reverted to a previous state at any given time, and they are preserved in the image if it is persistent in the image datastore. For instance, you can attach a disk to a VM, create a snapshot, detach it and attach it to a new VM, and revert to a previous state. Very handy, for instance, to keep a working history of datablocks that can contain dockerized applications. Also, in 4.14 snapshots are taken into account for quotas, accounting and showback, so cloud admins can keep track of disk usage in their infrastructure. The ability to save VMs into VM Templates for later use is another feature that must be highlighted in this release. This new operation is accessible both from the cloud view and the admin Sunstone view. Of course, also from the command line interface. One great improvement for cloud admins is a much better state management of VMs. It is now possible to recover VMs from failed state instructing OpenNebula to take the last action as success, to retry it or to make it fail gracefully, to recover for instance from failed migrations. Overall, a great effort was put in this release to help build and maintain robust private, hybrid and public clouds with OpenNebula. The OpenNebula team is now set to bug-fixing mode. Note that this is a beta release aimed at testers and developers to try these new features (not production environments) and send a more than welcomed feedback for the final release. There are a number of very interesting features that will make their appearance in the final release but not present in the Beta1, like for instance better support for Qcow2 for live snapshotting and GPU support for VMs. Disk snapshots with Ceph backend was funded by Unity in the context of the Fund a Feature Program. Qcow2 snapshots implementation was funded by BIT.nl in the context of the Fund a Feature Program. GPU devices support was funded by SURFsara in the context of the Fund a Feature Program. Flexible network attributes definition in contextualization was funded by Université Catholique de Louvain in the context of the Fund a Feature Program. https://opennebula.org/wp-content/uploads/2018/11/opennebula_cloud_logo_white_bg-4.png 0 0 Tino Vazquez https://opennebula.org/wp-content/uploads/2018/11/opennebula_cloud_logo_white_bg-4.png Tino Vazquez2015-07-29 12:16:072015-07-29 12:16:07OpenNebula 4.14 'Great A'Tuin' Beta 1 released! Many thanks to all the speakers for doing such a great job and sharing their ideas with the audience: Eliot Eshelman (Vice President at Microway, Inc), Varadarajan Narayanan (CEO at Megam), Alex Gorbachev (Intelligent Systems Services Inc), Jimmy Goffaux (Ingénieur Administration Système at IPPON HOSTING), Daniel Dehennin (Ac-Dijon), Guillaume Oberlé (Université de Strasbourg), Chris Johnston (Principal Platform Architect, Cloud Team at BlackBerry Limited) and Khoder Shamy (Principal Technical Lead, Cloud Team at BlackBerry Limited). You can find the slides in the page for each TechDay. We would like to give a special shout-out to the audience for all the 3 events, for being especially engaged and friendly. Quality conversations and lots of great networking. Thanks a lot! Remember, if you want to bring the TechDay to your hometown, drop us a line and we will be happy to oblige! As you may know, next week (6th of July) members OpenNebula team will be on the road to participate in two very interesting Cloud Technology Days. 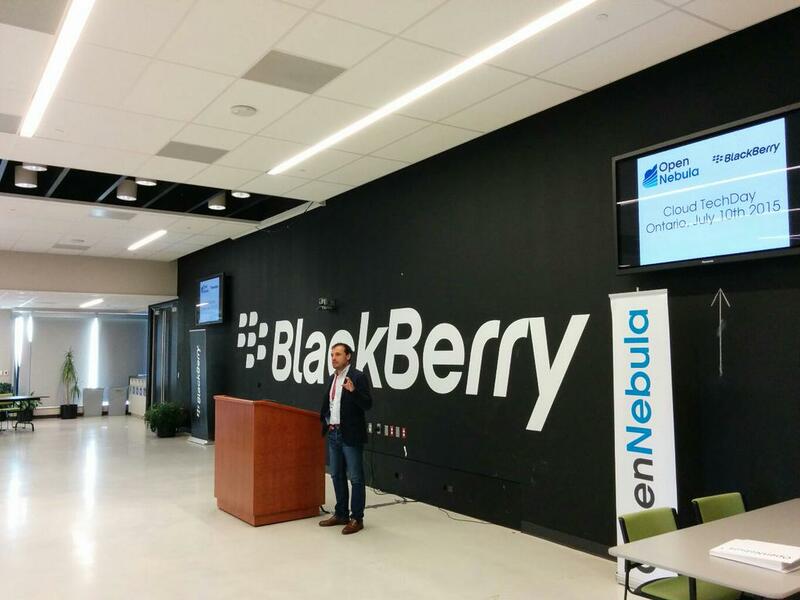 TechDays are full day events to learn about OpenNebula with workshops, and presentations from community members. In both TechDays, core developers of OpenNebula will unveil and demo juicy features that will make their appearance in OpenNebula 4.14, Dark Horse. The OpenNebula Cloud Tech Day on the 8th of July in Paris, France, is being organized by IPPON Hosting (thanks a lot!) in their premises. Check the agenda for more details, the highlights are presentations by Jimmy Goffaux from IPPON Hosting sharing their use of OpenNebula self-service interface and several other nifty features, and by Daniel Dehennin, who will let us know about the use of OpenNebula by two french ministries. If you are in Paris next 8th and want to learn more about OpenNebula, heard community experiences and share your own, don’t think about it any longer! The Ontario TechDay is being hosted by BlackBerry (kudos to you!) in one of their premises in Waterloo, ON, Canada. BlackBerry staff Chris Johnston, Principal Platform Architect in the Cloud Team; and Khoder Shamy, Principal Technical Lead in the Cloud Team, will present the use-case of OpenNebula at BlackBerry that facilitated building a large multi-regional and multi-tenant private cloud for internal service loads. See the full agenda for more details and the other contents of the TechDay. If you are on Waterloo on the 10th, don’t think about it and register for this event to learn how OpenNebula is being used in a massive scale deployment. We hope to see you there!